I’ve been asked to reconsider “the enormity of my project” :p by thinking not only of fiction writers, but also of other type of writing: academic, documentation, etc. 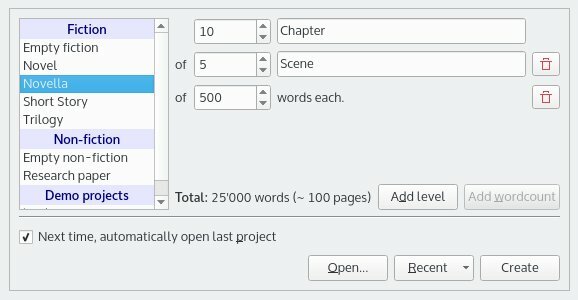 Manukskript now offers two modes: one “fiction” mode with all the tools for fiction writers (summary, characters, plot, world/context, etc. ), and one “simple” mode, with only the writing tab. In “simple” mode, manuskript is like a “simple” outliner. Note: the terms “fiction” / “non-fiction” are probably not the best. I’m open to correction from english-speaking folks. Merci pour ce projet. Excellente idée. Moi qui cherche depuis longtemps une alternative à Scrivener viable, fonctionnelle, libre, fonctionnant sous linux nativement… Génial. Je soutiens à fond. Je viens de faire un don. Je vais aider par remontée d’expérience. Peu éventuellement relire le français si besoin. Is there a way to make my version of the software look like the one in the screenshot above? I prefer this “streamlined” view to the default one. What do you mean by that? How does it look for you? How do I turn on the snowflake mode so I can use the snowflake method? It’s greyed out for me in this option here. 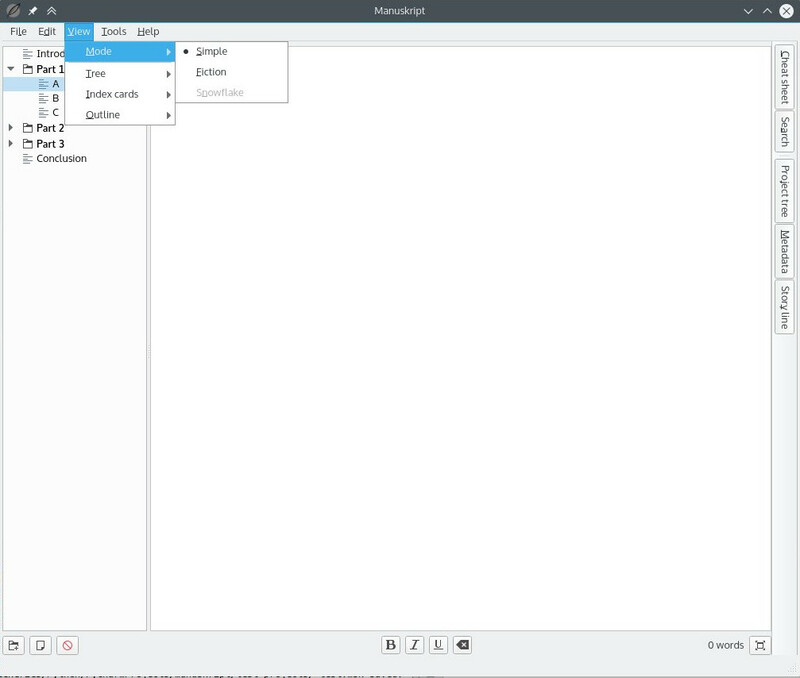 Manuskript is still under development and the View -> Mode -> Snowflake menu option is not yet enabled. Initial work on a guided snowflake method is available via the Next button, such as on the Summary, and Character panes. Please add this information on the main page under snowflake picture. I searched whole wiki and github site to find why “snowflake” option in View->Mode->Snowflake is greyed out:). BTW – great application. It might make more sense to remove the View -> Mode -> Snowflake menu entry entirely. However I will wait until I get in contact with Olivier to learn his thoughts as he is the creator of Manuskript. In order to compile / export to PDF both the pandoc and texlive-latex-recommended packages must be installed. See Run Manuskript from Source Code on Linux – Optional Package Installation. Consider donating to support it’s development.